Named after the Indian from whom this land was bought in 1696, Wampus Pond means “opossum.” A recent cultural resources inventory performed by Parker Harrington indicates that early 20th century rock shelters, several Native American artifacts and remnants of historically significant residential developments were found within or near the park. The natural pond, at one time known as Wampus Lake Reservoir, was once part of the New York City water supply. In 1963 the county bought Wampus pond and 93 acres from the City of New York. 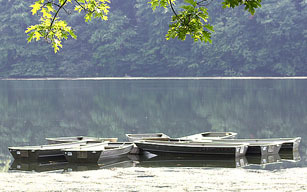 Park hours: Rowboats are available weekends and holidays, from 7 a.m. to 5 p.m., from Memorial Day through Labor Day. Dogs: Must be leashed. Please pick up after your pet. No dogs allowed in picnic areas.